Silently and steadily, impersonation has become big business. Posing for profit is the new black. Over the past few months, LMH has been besieged by imposters pretending to be us. They “borrowed” our email address to send emails out to the world-at-large with offers for… well, you can imagine. Some of our most trusted colleagues’ businesses have been hit too. It’s not easy to watch someone trashing your reputation. Imitation may be the sincerest form of flattery, but this feels like a sucker punch. Hiding behind another identity and sullying someone else’s reputation in order to profit by taking advantage of other people is just… wrong. Some perpetrators may believe that it’s a victimless act because there is no violence involved. That is simply untrue. Surprisingly, the people responsible for what happened to us did not need to gain access to our accounts. They were able to make their emails look like they came from us (which routed all the bounced messages to our server too) even though they sent them on their end—a shady little trick some of you know is called “spoofing.” Our accounts weren’t touched. To add insult to injury, spoofers have commandeered a word I’ve always loved. “Spoof” sounds lighthearted and fun, like an April Fool’s prank. Yes, there is trickery involved, but it’s innocent in nature. To use for exploitative, deceitful and harmful business alone, corrupts my beloved language as well. How dare they?! Ok. It’s not like my outrage comes from surprise. I’m not (completely) naïve about the underbelly of the cyber world. It’s full of sneaky activities and things that aren’t what they seem (#alteregoavatars). It’d be easy to assume that the virtual universe would be the chosen headquarters for the boldest posers. That was when my New York City field training kicked in. Something was off with this situation. It was happening so fast that I wasn’t sure if I had misunderstood what was going on. After all, I’d heard of plenty of instances where people masqueraded as clergy and nuns. There seemed to be a language barrier, so asking him to clarify his identity and mission did not look like a good idea. I apologized, refused the bracelet and handed him back the card. “I’m so sorry,” I told him. He pocketed the bracelet, took the card back and continued down the street. It was the fake kind. 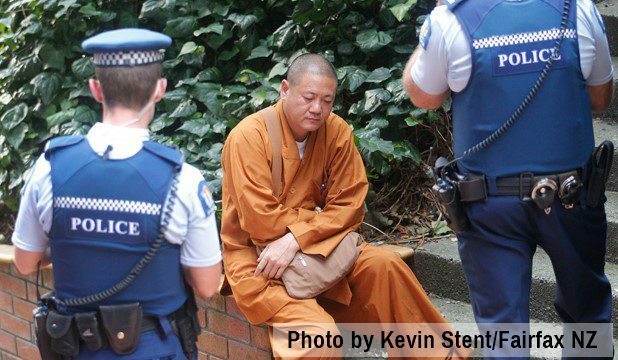 As I write this, I saw the same monks again tonight on the TV news. Turns out, these imposters/scam artists have been on the scene for a few years. And worse, they have a reputation for being aggressive (even physically, on some occasions) when they don’t get what they want. As maddening as the virtual spoofing attacks have been to me, my team, and my colleagues in the same boat, the whole experience got me really curious as to how the Buddhists are responding to being spoofed live in the flesh. Turns out, they have been peacefully warning people around the world, on the streets and in social media. Some Buddhists confront their phony counterparts, asking about their affiliation or quizzing them about the religion’s precepts (to which the imposters remain silent or walk away). Others hold a sign warning potential victims, and follow imposters around the city, silently undermining their ability to scam people. I’d like to think that someday, I will respond with their humility and grace. One day, maybe, I will transcend beyond finding these acts reprehensible and offensive. I’ll have to consult with a monk about it—the next time I see a real one.